Pleiadi 2 light wall sconce, by &' Costa, is imported from Italy. 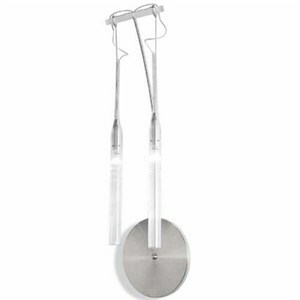 Two Pyrex diffusers are suspended from stainless steel arms, an excellent choice if you are looking for simple and elegant accent lighting. Dimensons: 29.5" H X 6.3" Extension. Uses 2 X 20W max 12V (electronic transformer) G4 halogen lamp (not included).